With the season turning from brutally cold to somewhat nice in Canada, it can only mean one thing: NHL playoffs. There will be sixteen teams who get an invitation to the "Big Dance", meaning fourteen teams will spend their springs asking "Where did we go wrong" in preparation for the NHL Entry Draft in June. Despite there only being sixteen invitations being made up, there are as many as twenty NHL teams still competing for those invitations. And that's what makes this last week in the NHL so great: almost every single game has implications on the playoffs in terms of who gets in, and who watches from home. Today, I'll look at the Western Conference where we know that Detroit and San Jose have clinched their respective divisions, meaning they will start the playoffs in the first and second seeds. The Sharks can still catch Detroit for first overall in the NHL as the Wings lead the Sharks by five points, and both teams have three games remaining. However, Detroit losing three games in a row at this point of the season seems unlikely. The Anaheim Ducks are platooned in the fourth-seed, and will remain there unless they lose their remaining two games, and Dallas wins their remaining three. Again, I see this as highly unlikely. However, Minnesota is going to the playoffs as well, and should be the third-seed unless the wheels fall off. Here's where it gets blurry. Let's go over these situations one-by-one. Colorado needs two points to guarantee themselves a playoff spot. They play the Canucks and the Wild in their last two games. The Avs are four points behind Minnesota for the division lead, and three points ahead of Vancouver who are currently in eighth place. Every single point counts for Colorado. Calgary is the seventh-seed right now. The Flames play the Oilers, the Wild, and the Canucks in their final three games. The Flames lead the Oilers by four points in the standings, and the Canucks by two points. If the Flames win out, they can catch and surpass the Wild for the division lead, but they will need help from both the Canucks and Avalanche. The Canucks are holding down the last playoff spot right now, and have games against the Avalanche, Oilers, and Flames remaining. The Canucks trail the Avalanche by three points and the Flames by two points, and have a two-point advantage over the Oilers. The Canucks basically have to grab as many points as possible to hold off Nashville, Edmonton, and Chicago. The Nashville Predators have a home-and-home with the St. Louis Blues, followed by a game with the Blackhawks to close out the season. If anyone's schedule has to be favoured for them to make the playoffs, it's the Predators. The Predators can basically eliminate the Blackhawks in that last game as well. They currently trail eighth-place Vancouver by one point, so every point counts for the Predators at this point. The Edmonton Oilers are sitting two points back of Vancouver. They play the Canucks and Flames in what could be called "the biggest games of the season" for Edmonton. Looking back, though, it appears the Oilers have been in playoff mode since mid-January. If the Oilers make it through these two games and into the playoffs, I'd be very scared of a possible first-round upset. The longshots of the Western Conference playoff push are the Chicago Blackhawks. The Hawks currently sit four points back of Vancouver, and will definitely need help. The Hawks basically have to win all three games they play. The problem is that they have the Red Wings twice, and the Predators once. Not good... not good at all. I'm writing the Blackhawks off at this point. I just don't see Vancouver making it through the Avalanche and Flames. The Oilers are in the same boat in terms of making it past the Flames - I don't see it happening. The Blackhawks need to play mistake-free hockey for the next week just to have a shot, and I don't see that happening as well. As with all my predictions, I'm most likely to be wrong, so don't take my word for anything that happens. Vancouver fans, I just don't see your team making it with only two games left on the schedule and needing as many points as possible, especially when you consider Nashville's schedule. This week looks very promising in terms of the upcoming action. Find a TV or radio, and tune in! April 9th will be here before you know it! The 2008 IPC Sledge Hockey World Championship kicked off yesterday with five games, one of which featured Team Canada. Canada squared off against Italy in their first game in Marlborough, Massachusetts, and it was expected to be a fast, exciting affair. It took six minutes for the scoring to open, and by the time the dust settled, eleven goals had been scored. The only problem was that Canada skated to a shutout. Paul Rosen, the Canadian goaltender, made three saves in the shutout. That's right: three saves. Canada basically dominated the puck-control game, and even had several spectacular scoring chances while shorthanded. The Italians were, for the most part, overwhelmed in this game by the Canadians, and the scoreboard showed the results with Canada winning the game 11-0. Canada's Hervé Lord opened the scoring six minutes into the first. At the 11:27 mark, the Canadians went up 2-0 on Greg Westlake's first goal of the game. Westlake pushed the score to 3-0 with his second goal of the game at the 21-second mark of the second period. Billy Bridges made it 4-0 with his first of the game on the powerplay at 9:47 of the second, and Marc Dorion scored unassisted 47 second later to make it 5-0. The onslaught continued with Bridges notching his second of the game at the 4:27 mark of the third period. Todd Nicholson scored at the 7:13 mark, and Hervé Lord scored his second of the game 37 seconds later. Raymond Grassi scored on the powerplay at 11:44, and Graeme Murray followed that goal up with one of his own at 12:21 to make the score 10-0. Bridges capped off the hat trick at 13:37 to give Canada the 11-0 victory. Canada faces Germany tonight at 7pm EST. The big victory over Italy should give the Canadians much needed confidence against the Germans, and is hopefully the first step in securing a gold medal. Playoff Watch: If I read this correctly, we'll have no Los Angeles, no Tampa Bay, no Atlanta, no St. Louis, no NY Islanders, no Columbus, no Florida, and no Toronto. And in case you're keeping track, that's the order from worst to somewhat-terrible in terms of lottery balls in the draft. Los Angeles is two points ahead of Tampa Bay in the race for the first overall pick, and Tampa Bay has a game in hand. Prevailing rumours out of Los Angeles say that Lombardi is seriously looking at Drew Doughty as the first overall pick if his team secures that draft position. I'm all for the Kings drafting Doughty, but, if I'm the Kings, I'd look to swap down with whomever selects second. Why? If I can draft Doughty or even Alex Pietrangelo with the second or third pick while acquiring some decent talent via the trade, I'm already ahead. However, the Kings also have Dallas' first-round pick this year, and with Dallas free-falling in the standings, it might be a great idea to go after a solid, defensive defenceman like Luke Schenn as well. If Lombardi is serious about improving his team significantly at the 2008 NHL Entry Draft, he certainly has a lot of options to consider. The two defencemen of the OHL, Doughty and Pietrangelo, bring a lot of skill. However, Lombardi was criticized for passing up a warrior like Karl Alzner of the WHL to select Thomas Hickey. Luke Schenn, who is a better defensive defenceman than Alzner in my opinion, should end that critics' whine in spades. As much as it pains me to suggest packaging Cammalleri and the draft pick for a top-level centerman and a lower pick, it should be examined in detail. Cammalleri has shown great potential in terms of his talent, but he never seems to fulfill that potential due to injuries. If the draft plays out the way it's supposed to, I don't see why Los Angeles can't swing a deal for a top-notch goalie or a smart, offensive centerman. However, since I'm not the GM, I can't tell you how this will go. I'm missing Pittsburgh and the Rangers square off right now, so I'm taking off. Have a good one, and there will be more fun this week as playoff spots are settled! In a rather interesting news story published yesterday, it appears we may have discovered another disciple of the "Alexei Yashin School of Hockey". 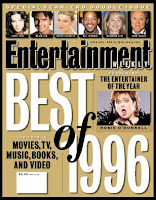 As discussed on this site before in an article entitled "The End Or The Start Of An Era? ", I basically gave all the reasons why no NHL team should sign Yashin for any amount of money to play in the NHL. Of course, Yashin ended up playing for Yaroslavl Lokomotiv this season in the Russian SuperLeague, and is now considered an afterthought in terms of being an NHL player. Apparently following in his footsteps will be another New York NHL player: Jaromir Jagr. According to the Bergen Record, a New Jersey-based newspaper, Jagr is interested in meeting with representatives from Avangard Omsk of the Russian SuperLeague about playing there next season. Avangard GM Anatoly Bardina is heading to New York City to speak to Rangers' GM Glen Sather regarding the status of Alexei Cherepanov. Jagr played for Avangard during the 2004-05 lockout. Jagr will most likely become a free agent after this season as his option year would only become a realized contract year if he either hit 84 points for the season, or the Rangers make the Eastern Conference Finals. The former will not happen, and the latter seems unrealistic. "I said a long time ago I have to finish the season. Whatever happens after that, I don’t know," Jagr said to the Bergen Record. "We’ve got a long ways to go. I’m here. I know you don’t see me in some games, but I’m still here." That doesn't sound like he really wants to be a member of the Rangers any longer, does it? Back in 2005, ESPN.com reported that Jagr was concerned the salary cap will limit his earning potential. He had considered playing in Russia at that point, so it's not like he hasn't given this much thought. With his dramatic drop-off in the stats category, it is highly unlikely he would find a team willing to shell out $8 million per season for him after this season. Personally, it appears that Jagr has reverted back to his late days with the Penguins with his apathy and complete uselessness on the ice. He looks uninterested on the ice, and, despite the captaincy, seems unmotivated to take his game to another level. Washington Capitals' fans can relate to that last statement. Personally, if Jagr wants to go play in Russia next season, I say let him go. As amazing as he once was, he seems to be a shadow of himself now. Age may have caught up to him, but it appears he has no passion any longer, in my opinion. Russian billionaire Roman Abramovich can pay him whatever amount of money to get a listless star show up. After all, they paid him - tax-free - to play there once before. The less physical game and shorter season of the Russian SuperLeague would most likely be the motivating factors in his decision. In regards to Jagr's impending departure to Russia, here are some of the more memorable Jagr goals and set-ups of all-time. If you notice, no goals listed past 2000. Jagr embarrasses Matt Hervey. Hervey played only 35 total NHL games. Jagr's overtime goal versus Magnitogorsk in 2005. If this is the last time we see Jagr in the NHL, he certainly would be Hall-of-Fame worthy. However, we still have the NHL playoffs this season, so Jagr's time in the NHL isn't quite done yet. It's fun to watch fabulous players skate like the wind while walking around four or five players to score a beauty goal. Guys like Sidney Crosby, Evgeni Malkin, Alexander Overchkin, Jonathan Toews, and Peter Stastny are the new generation of stars who seemingly have the puck on a string while they skate the length of the ice. There have been many players that have had this skill through the years, most notably Wayne Gretzky, Mario Lemieux, Jaromir Jagr, Peter Forsberg, and Pavel Bure. The art of dangling - walking around players like they aren't even there - is a skill that takes innovation, creativity, and great puck control skills. When done wrong, it's a monster turnover. When done right, though, it's art. Here some absolutely amazing efforts by some of the bonafide stars of the NHL. Creativity and puck control is served up like it's a buffet here. Jonathan Toews looks like he's playing pond hockey. Rick Nash demonstrates the "How's She Goin'?". Evgeni Malkin goes inside-out on the Devils. Honestly, when you see goals like this, it electrifies everyone. Highlight reels queue them up over and over as they are dazzling displays art and skill in a violent and rough game. And that's why hockey is so good. It's the only place where you can witness the combination of immense talent and jaw-dropping skills on ice. I feel for some of the goalies in those highlights, though. It's their job to stop what seems to be an inevitable highlight reel goal. Most often, they're fishing the puck out of the net behind them. I'll have some updates from the Sledge Hockey World Championships this weekend, as well as the clearer playoff picture as teams start falling off the radar for playoff spots. It's a big weekend for national sledge hockey programs around the world as the IPC Sledge Hockey World Championships are about to get underway in Marlborough, Massachusetts. The tournament runs from March 29th to April 5th at the New England Sports Center, and features teams from Canada, the USA, Germany, Italy, Norway, and Japan in Group A, while Group B features the Czech Republic, Estonia, Korea, and Poland. While I'll be cheering Team Canada on as they look for their first gold medal since 2000 in Salt Lake City, Utah, this article is actually to draw attention to the sport a little more. I was contacted by Miss Alison Love via email regarding my previous coverage of sledge hockey events. Miss Love wanted to pass on some info regarding the upcoming World Championships, as well as some very exciting news, in my humble opinion. You see, Miss Love is a producer who is currently working on a movie entitled Sledhead. Sledhead is a documentary about the Team Canada sledge hockey team, and the struggles and challenges facing the team as they head towards the World Championships in Massachusetts. Miss Love's credentials are impeccable. According to her biography on the Sledhead website, Alison is a "multiple award-winning Marketing Director", and "graduated from college with a diploma in Television Arts". She's worked on a number of Discovery Channel series, including "Only In America", and has also been a production manager for a Slice Network production. On this project, she teamed up with David McIlvride to direct the documentary. According to his biography on the website, Mr. McIlvride also comes with impressive credentials. He's "a two-time Gemini Award winning producer", which is the Canadian version of the Academy Awards. He has been involved in a number of highly-reknowned programs, including having produced "Adoption Stories, a television series for Discovery Health that won an Emmy". This documentary reminds me of the amazing work done on the movie Murderball, the documentary that examined the struggles and challenges of the Canadian and American Paralympian rugby athletes. It won thirteen awards, and received another seven nominations, including an Academy Award nomination. If you haven't seen this movie, I suggest checking it out. It is a phenomenal look at what these men go through every single day, and just how much we may take for granted. You can get more info here about Sledhead and the goal of the movie. Perhaps the best part of the entire website is the demo movie. If you can't feel the passion these guys have for the game of sledge hockey, you might want to see if your heart is still beating. Check out the Sledhead blog here as well. I look forward to seeing this movie in its entirety, and I applaud and commend Alison Love and David McIlvride for exposing this sport to the world. Their website alone is an excellent resource for information. Watch for Sledhead on television. As the website says, Sledhead "is a story of a remarkable team of athletes and even more remarkable men". The QMJHL handed out their suspensions yesterday to the participants involved in the Chicoutimi-Quebec brawl. In case you may have missed it, you can read all about it here. Jonathan Roy deservedly got the longest suspension for his actions in the melee while his father and coach, Patrick Roy, received the longest suspension for a non-player. Chicoutimi also received punishment, most notably Sebastien Rioux, the second player that Roy fought. Both teams were fined, and Jonathan Roy also received a fine for his inappropriate gestures towards the Chicoutimi crowd. Did the "Q" do right? I'll examine that below. - "Quebec Remparts goaltender Jonathan Roy is suspended seven games and receives a $500 fine for his assault on the opposing goaltender, Bobby Nadeau, as well as for the inappropriate gestures which he aimed at the crowd at the Georges-Vézina Centre during last Saturday’s game". - "Remparts defenseman Maxime Lacroix is suspended for three games after hitting an opposing player while he was still down". - Remparts forward Marc-Oliver Vallerand received a two-game suspension for his role in the melee. - Remparts head coach "Patrick Roy is suspended for five games for his prejudicial conduct. - "[T]he Remparts organization is fined $4,000". - "Chicoutimi Saguenéens winger Antoine Roussel receives an automatic one-game suspension for being the instigator in a fight". - Saguenéens forward "Charles-Antoine Messier is suspended two games for an assaulting penalty". - Saguenéens defenceman "Sébastien Rioux will miss his team’s next six games after he left the penalty box (automatic five-game suspension plus an additional game) to enter the melee". - Saguenéens head coach "Richard Martel receives an automatic two-game suspension as stipulated in League rules after his player, Sébastien Rioux, left the bench to participate in the on-ice melee". - The Saguenéens organization is fined $4,000 ($3,000 + $1,000 automatic for the player leaving the bench). The Commissioner of the QMJHL, Gilles Courteau, also advised both teams that the league found "the events which took place over the course of last week-end’s games deplorable and unacceptable. We are deeply troubled by the incidents. In closing, I’d like to warn organizations that these types of incidents will not be tolerated and that should any more occur, steep fines will be handed out." So where do I begin? I had suggested in the Playoff Brawl article I wrote that I thought both Patrick and Jonathan Roy should be suspended for the entire first-round playoff series. Well, Mr. Courteau essentially did that. Jonathan Roy will not appear again in this series, and Patrick Roy may not be back as well, depending on how Quebec fares in their remaining games against Chicoutimi. I think the suspensions fit the crime very well. I think the fines, while seemingly low, will also encourage the teams to tell their players that this type of behavior is completely unacceptable. Jonathan Roy's $500 fine isn't overly large either, but that's $500 less that a junior player receives out of his stipend. Yes, I'm aware Patrick Roy is his dad and can probably afford this, but it's $500 out of someone's pocket at the Roy household, and no one will be happy about that. I was not aware that Sébastien Rioux left the penalty box when he and Jonathan Roy began their fight. In regards to this, I believe his suspension is also warranted. While I feel for Mr. Martel as he had no opportunity to restrain his player from going onto the ice, it should be understood that this type of action is also completely unacceptable, and that the coach is responsible for his players regardless of where they are. I had said in the previous article, "Your players are a reflection of you" when speaking of Patrick Roy's actions, but the same goes for Mr. Martel. His players have to know that leaving the box to join a brawl will only result in the harshest of penalties. Mr. Martel's two-game suspension, and the fine associated with having a player leave the bench to join the fight, are justified in this case. As for the other players, the video never noticed them, but I think Mr. Courteau handled the incident well in regards to those suspensions. In the end, Mr. Courteau sent a very clear message while being fair about the vacation time he handed out. Like he said in his statement, the actions of both teams were "deplorable and unacceptable". The NHL should be looking for Mr. Courteau to replace Colin Campbell if Mr. Campbell steps down. The suspensions took into account the actions of the players, not the players themselves. I would like to see what suspension Mr. Courteau would have given to Chris Pronger in regards to the "Stomp Hear 'Round The World", but that's another debate for another time. Mr. Courteau did the right thing. It may not be popular with Quebec fans or Chicoutimi fans, but sometimes doing the right thing is not always the popular thing. Thumbs-up from this writer, Mr. Courteau. For full details on all the suspensions, please click here for players and here for coaches and teams. The Canadian Interuniversity Sport Men's Ice Hokcey Championship was decided Sunday night in Moncton in front of 4700 fans, and the Alberta Golden Bears stand atop the mountain after defeating the University of New Brunswick Varsity Reds by a score of 3-2. It's the third CIS Hockey Championship in the last four years for the Golden Bears, who previously won back-to-back championships in 2005 and 2006. It is the 13th Men's Hockey Championship overall of the University of Alberta, and the second time they've won it in Moncton. Ian McDonald of the Golden Bears, an Edmonton native, was crowned MVP of the tournament after leading all players in scoring with six points. Former all-Canadian and CIS rookie of the year Aaron Sorochan, also hailing from Edmonton, was named player of the game for Alberta after making 40 saves in the win. "They had some good opportunities. My whole mind-set was keep my eyes on the puck at all times," Sorochan said to CIS reporters. "Tonight I was just mentally plugged and it showed with a couple of big saves early for the guys, and they scored for me late." Alberta head coach Eric Thurston has won six CIS championships. His first title came a player in 1985-86 with the Bears, and then was an assistant coach with Rob Daum for three titles in 1999, 2000 and 2005. He has now won two titles as head coach, those coming in 2006 and 2008. "I’m really proud of these guys. This is an incredible feeling obviously," Thurston said to CIS reporters. "UNB is just an incredible team, they’ve got a great organization. I said to [UNB head coach Gardiner MacDougall] after the game that we need to have a best-of-seven series because university hockey at this level is just great." McDonald spoke of how close the teams were. "It is extra sweet, coming into this game as the underdog. We knew we had a good team but we knew they did too," he said. "Both teams played well tonight and the game could have gone either way. It just happened that we got a few bounces go our way." McDonald scored the winner in the final, while assisting on the tying goal by Tim Krymusa, a Morden, Manitoba native. Brian Woolger, also from Edmonton, scored the third Bears goal in the final. Justin DaCosta, a Mississauga, Ontario native, and CIS player of the year Rob Hennigar, hailing from Jordan, Ontario, replied for the defending CIS champion V-Reds, who came into the duel riding a 21-game winning streak. Sophomore goaltender Michael Ouzas of Hamilton made 20 saves in the loss. The second-team all-Canadian had recorded a 5-0 career record at the University Cup dating back to last year, and had only allowed four goals in his first five starts at Nationals. Congratulations to the Alberta Golden Bears on their 2007-08 CIS Men's Hockey Championship! I don't know if you have heard of Kyle MacDonald, but it's time for NHL general managers to start thinking like him. MacDonald is now in the Guinness Book of World Records under the category of "Most Successful Internet Trade". MacDonald, the Belcarra, British Columbia native, traded the paperclip in the picture to the left for a variety of things in order to acquire his house. That's right: he essentially traded a paper clip for a house. Of course, there were smaller trades made for larger, more lucrative items, but that one red paperclip garnered him international attention for his innovative idea. It spawned a book, and he even has a blog about his adventure. So how does this relate to NHL GMs? Some of the smaller trades reaped large rewards for teams. The big names that got moved have, in some cases, cashed in, but it's the smaller names who have begun to really help their new teams out. If you picked Brad Richards as one of the stars of the trade deadline, you'd be right. In nine games with Dallas, he's picked up two goals and seven assists. A point-per-game average is exactly what the Stars need with some of the troubles they have putting the puck in the net. If the Stars can continue getting solid production out of Richards, they will have a much better chance of going deep in the playoffs than without him. When the Penguins acquired Marian Hossa at the deadline, no one even spoke of the throw-in player named Pascal Dupuis. Everyone, including myself, saw red lights flashing all over the NHL as the Penguins were thought to be an offensive juggernaut. In five games, Hossa has one goal and five assists - pretty good in terms of showing up as advertised. But what of Pascal Dupuis? To me, he's been the player who has made the Penguins a much better team after this trade. He's a speedy fore-checker, a relentless back-checker, and has discovered his offensive touch after struggling in Atlanta. In eleven games with the Penguins, Dupuis has scored two goals and nine assists. Scoring while in a checking role is a huge boost to any team. Scoring like Dupuis has done as a checking forward makes your team dangerous in the playoffs. The Sharks had talked of acquiring a puck-moving defenceman for a long time before acquiring Brian Campbell. They wanted someone who could help their transition game in getting the puck to their talented forwards. In Campbell, they got exactly what they were looking for. Campbell has recorded two goals and ten assists in thirteen games thus far, and has fit very well in the Sharks' system. One of those two goals was his spin-o-rama goal past Mike Komisarek to help the Sharks down the high-flying Canadiens a couple of weeks ago. Campbell makes the Sharks better offensively, and they finally have the catalyst on the blueline they need so that Joe Thornton has the puck more often. The guy that Brian Campbell was swapped for hasn't done poorly in his new surroundings either. Steve Bernier has looked very comfortable in the Barney Rubble Hairpieces' colours, and can skate with the fleet-of-foot Sabres as well. In ten games, Bernier has scored two goals and six assists. While he's gone pointless in his last three games, Bernier has looked impressive thus far as a Sabre. While it remains to be seen if the Sabres make the playoffs, Bernier has certainly helped them stay within striking range of that final playoff spot. The last guy who have been impressed with basically needed a change of scenery. Andrew Ladd went to Chicago where the youth movement is on, and he has turned on the scoring in Chi-town. In 43 games with the Hurricanes before the trade, Ladd had nine goals and nine assists, and Jim Rutherford basically saw him as expendable. 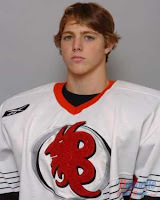 The 4th overall pick in the 2004 NHL Entry Draft arrived in Chicago after spending time with the AHL's Albany River Rats, and has done all that has been asked of him to help Chicago's floundering playoff hopes. In 14 games with the Hawks, Ladd has scored four goals and seven assists. Pretty good for a team not going to the playoffs. In terms of consistency, the Detroit Red Wings are the epitome over the last two decades of that term. And it all starts with preparation, so I'm told. Congratulations goes out to Mike Babcock who set the record for posting three 50-win seasons in a row after taking over a team. Babcock has always been regarded as a great coach through his entire coaching career, and this is just a reflection of how good he is. Congrats, Mike, and here's to another 150 wins over the next three seasons! Congratulations also goes out to Joe Sakic of the Avalanche who recorded his 1000th career assist against the Edmonton Oilers on Saturday. Sakic became the 11th NHL player to attain that mark. "I'm sure one day, when I look back, I'll think about it as a good accomplishment for myself to have," Sakic said to the Denver Post after Colorado's 7-5 loss. "It's tough to think like that after a game you need to have." Congratulations, Joe. I'm sure you'll appreciate it more once you get a chance to reflect on that amazing accomplishment. That's all for today. I'm missing the Penguins-Islanders game as you read this, so I'm gone. More on Jonathan Roy tomorrow as the QMJHL hands down their disciplinary actions regarding Saturday night's melee in Chicoutimi. I'm quite certain that hockey fans everywhere, specifically in Detroit and Denver, remember this scene to the left. Patrick Roy fought Mike Vernon following the Claude Lemieux hit that seriously injured Kris Draper. Roy also fought Chris Osgood, but it remains significant as it showed the intensity that Patrick Roy brought to the rink every night. Roy was never one to shy away from controversy, and he found himself in the middle of another brawl on Saturday in the second game of the QMJHL playoff series between the Quebec Remparts and the Chicoutimi Sagueneens. However, the fighter in this brawl wasn't Patrick, but his son, Jonathan, who plays net for the Remparts. The Remparts are coached by the senior Roy. Jonathan Roy, #30, in red. My thoughts are below. At the one-minute mark, you see Roy skate from his net and signal to Bobby Nadeau that they should engage. Nadeau, knowing his team is up 7-1, clearly has no interest in fighting Roy. However, at the 1:01 mark, you see Jonathan Roy look at the bench, and then he snaps. What happened, you ask? According to reports, his father and coach, Patrick Roy, told his son to go after Nadeau. Roy, as you watched, skated the length of the ice and pummeled Nadeau, even when Nadeau was on the ice. After flipping the bird to the Sagueneens crowd, he then fought defenceman Sebastien Rioux. Roy received a game misconduct for his actions. Excuse my language here, but what the hell is wrong with the Roy family? Look, I get that pride runs deep in the Roy household. No one likes being embarassed in a 7-1 game. I'll even listen to the argument that this brawl will solidify a dressing room; that standing up for your teammates in a brawl shows support for everyone else on the bench. However, I will not believe that what Jonathan Roy did falls under either category since he engaged a player who had no interest in fighting, and then rained blow after blow down on him after Nadeau was on the ice. To make matters worse, he then disrespects the game by giving the fans in attendance the finger. As unfathomable as it is, Patrick and Jonathan have not only brought a black mark upon themselves, but the entire Remparts team. This isn't some gladiator war in the Colosseum. This isn't a pro wrestling match. This is a hockey game. Again, people will claim it to be war since these teams are battling for their playoff lives. There is no excuse, however, for what Jonathan Roy did, and there is absolutely everything wrong with what Patrick Roy did in ordering his son to skate down the ice. While I realize that there is a fierce rivalry between these two teams, Patrick and Jonathan Roy just took it to a sickening level. According to a statement on the QMJHL website, "[t]he Commissioner of the Quebec Major Junior Hockey League, Gilles Courteau, and the disciplinary committee will review the incidents which occurred over the course of the first few playoff games and will make an announcement as to fines and suspensions Monday evening, if necessary." If necessary? Are you kidding me? Patrick and Jonathan Roy should both be suspended for the length of the first-round of the QMJHL playoffs at a minimum. Also, the Remparts should be fined for Patrick Roy's actions. These kinds of actions cannot be tolerated or accepted in the game of hockey. If Nadeau had been seriously hurt, the Sagueneens would have lost one of their best players. Watching this kind of stuff in junior hockey makes me wonder how NHL teams judge players in terms of their draft eligibility. Would you want Jonathan Roy on your team after seeing something like this? Despite all his talent, I think I'd take a pass. After all, your starting goaltender is useless sitting in the press box, especially if he put himself there with actions as disgusting and stupid as these were. Take a long look in the mirror, Patrick Roy. Your players are a reflection of you. Congratulations goes out today to Alexander Ovechkin who did something that no one else has since the 1995-96 season. Ovechkin scored his 60th goal of the season last night versus the Atlanta Thrashers, the first man to do so in the NHL since Jaromir Jagr and Mario Lemieux attained that level in 1996. In saying that Ovechkin is a sniper would be an understatement. The first overall pick from the 2004 NHL Entry Draft hasn't scored less than 46 goals in any of his three seasons thus far, and has tallied 158 goals in three seasons to this point. I'm quite certain that if Ovechkin stays healthy, he will be regarded as one of the greatest goal-scorers of all-time. Heck, he might have that title already. When Gretzky's impressed, you know you've done well. To give you an idea of how long it's been since someone scored 60 goals, here are some remarkable events that occurred between September 1995 and June 1996, or the last time someone scored 60 goals in the NHL. - Cal Ripken Jr. broke MLB's all-time consecutive games played record. - OJ Simpson was found not guilty in the deaths of Nicole Brown Simpson and Ronald Goldman. - The Atlanta Braves won the World Series. - Quebec seperatists lost a referendum in Canada for their independence. - The Dallas Cowboys won their 5th Super Bowl. - Daniel Green was convicted of the murder of James Jordan, Michael Jordan's father. - Braveheart won the Academy Award for Best Picture. - "Unabomber" Theodore Kaczynski was arrested at his Montana cabin. - Major League Soccer opened its doors in the United States with the San Jose Clash defeating DC United by a 1-0 score. - The Chicago Bulls, led by Michael Jordan, set the record for wins in a season with 70. - The Colorado Avalanche won their first Stanley Cup, defeating the Florida Panthers in a four-game sweep. Congratulations, Mr. Ovechkin! May the highlight reel goals be plentiful for the rest of your career as well! I have searched long and hard for a picture of the mask that Tony Esposito is wearing in the picture to the left. I have never found one, but I do know that this mask is highly unique. 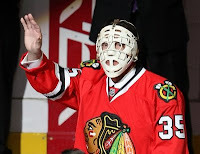 With the Chicago Blackhawks honouring their former players as of late, having Tony Esposito come out in his Blackhawks glory - mask and all - gets high marks from me. Rocky Wirtz and the entire Blackhawks organization deserves a gigantic kudos for reaching out to their former stars and bringing back the fans by the thousands in Chicago. Well done, Chicago! As the title states, there have been some updates done on this blog, as well as some additions. Let's start with the new additions to the Blog section. Hockey Guy: This is a blog written by current AHL and Wilkes-Barre/Scranton Penguin Ben Lovejoy. Honestly, it's highly entertaining, and extremely funny. I do have to admit that I appreciate Lovejoy letting us into his life. Seeing how an AHL player's life plays out can be, apparently, pretty entertaining. Globe and Mail Blog: The Globe and Mail, a national newspaper in Canada, has created an entire section for all its reporters to blog. Led by long-time and award-winning writer Eric Duhatschek, the Globe's writers express themselves candidly while using their professional status to get the inside goods. This blog is highly-informative. USHL Blog: The USHL Blog has player profiles and USHL news in one place. Personally, I find there isn't enough coverage of the minor and junior leagues, so I'm always happy when I find one that is as comprehensive and intelligent as this blog is. If you have any interest in the USHL, I suggest clicking on the link. Updates: There have also been some updates on HBIC. Starting with patch updates, I have added the Bob Gainey retirement patch to the Montreal section of the Patch It Up articles. I've also added the Brian Leetch retirement patch that the Rangers wore this season. You can find them both on Part Three of the articles. 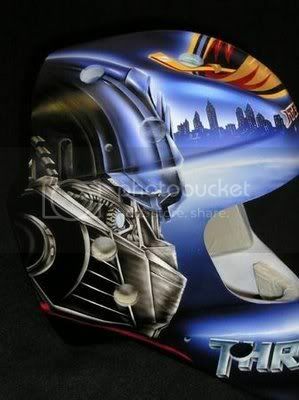 Also, Mike Wall of the Lake Erie Monsters in the AHL has decided that he'd look better as a Transformer. His mask is Optimus Prime's head. 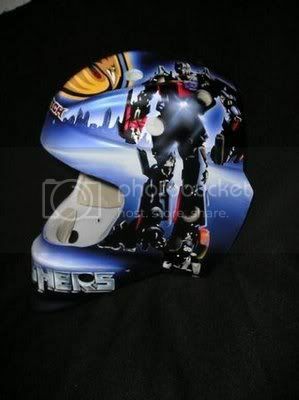 I've also added images of the Transformers-inspired mask that Kari Lehtonen is creating. Lehtonen is all about pop culture on his masks, and his Transformers mask is no exception, as seen on the left side and right side. You can see all the Hollywood-inspired masks by clicking here. Random Items: I have discovered some stuff that should be exposed for everyone to see. Jagr's mullet is worse than Barry Melrose's mullet. How did the Penguins let him go for so long with out telling him to fix his hair? A small animal could have lived in there. I guess when a player wins the Art Ross trophy, you let him have his way. This might be my favorite picture from the entire year. I love the way these jerseys look when hung together. If anyone can name every mascot in this picture by name without Googling them, you might be a bigger hockey nerd than I am. By the way, I love Youppi. He's the only mascot to have successfully cross into another sport. Montreal, again, shows why they might be the best franchise of all-time. The Dallas Stars make a mockery of their Icegirls. Pink fashion jerseys? Whoever came up with this idea should be fired immediately, quartered and drawn, and shot. The Icegirls work for the team. Let them wear the team's colours! I don't know how many people saw the story a few weeks ago, but the Penguins-Flyers game was delayed due to the zamboni breaking down. Apparently, there was a transmission problem. I'd say that's a safe bet, considering that there was more transmission fluid on the ice than in the zamboni. Hockey has appeared in many places, but there are some places where you rarely see it. The Canadian $5 bill has a quote from Le Chandail on it, as well as imagery of children playing hockey. Le Chandail is a story about how a young child from Montreal begs his parents to get him a Montreal Canadiens hockey sweater only to receive the hated Toronto Maple Leafs hockey sweater. The fact that this appears on our currency shows how deeply-rooted the game of hockey is in our society. 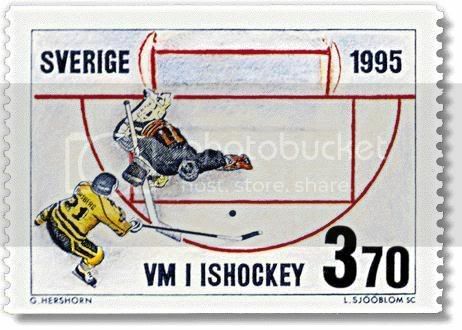 I don't understand Swedish, but that goal is Forsberg's legacy. 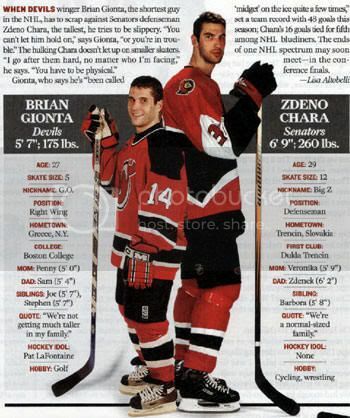 Lastly, we all know that Zdeno Chara is hockey's tallest player. However, do you know who the smallest is? If you suggested New Jersey Devils' Brian Gionta, you'd be right. This image shows the tale of the tape. 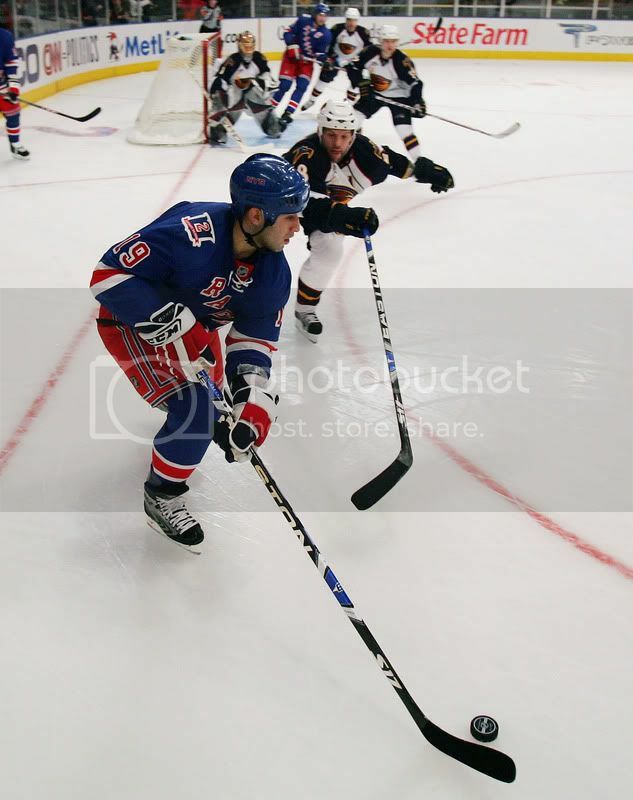 Gionta wears size-5 skates? There are peewee players that wear bigger skates than him! Ok, that's all the updates and fun stuff for today. I have a pile of stuff to get done, so if you have any questions or comments, leave them below. After watching the highlights of the March 19, 2008 game between the San Jose Sharks and Minnesota Wild, there has to be someone in the NHL Head Offices who has common sense. 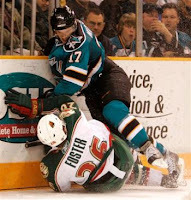 As pictured, Kurtis Foster of the Wild, to the left, hit the end the boards on an icing call after taking a check from Torrey Mitchell of the Sharks. The problem is that Kurtis Foster's season is over after breaking his femur when he hit the boards. The promising, young defenceman had a stabilizing rod put into his leg to help it heal. In hearing this, why hasn't the NHL gone to no-touch icing like international hockey? This isn't the first time this has happened. Pat Peake, a member of the Washington Capitals, has his career come to an end when he slammed into the boards chasing a puck that had been iced during Game Five of the 1996 Stanley Cup Playoffs against Pittsburgh. "It was J.J. Daigneault," Peake said to Mike Vogel of washingtoncapitals.com. "He had a step on me. I still say [Capitals' head coach Jim] Schoenfeld had me brainwashed, because I never would have raced for an icing before. But I raced for an icing, there was a loose puck. A lot of it was my fault; I put the stick on him and kind of water-skied. I did win the race, but that was it. It was the end of my career. “I can remember everything as clear as day. Kerry Fraser was the ref. He came up to me and said, ‘Hey Peaker, are you okay?’ [Caps trainer] Stan Wong came right out and I said, ‘I think I’m gonna be sick.’ Thank God that Pittsburgh’s locker room was at that end. When they carried me off they gave me a shot of medicine real quick. They cut all my equipment off. It was the playoffs, so we brought all our doctors with us. They went with me to the hospital, I had some x-rays, they put a cast on it and told me [my heel] was broken in quite a few places. It turned out it was broken in 12 places." Peake was 24 years-old when the injury happened. He's now 33 years-old, and still misses the game that had taken him so far in life. "There are certain times of year," he told Vogel, "like playoff time, where you kind of get the itch. I remember what it was like to go to the finals and I was around all that atmosphere. It was wild. Yeah, I do get a little bit grumpy every now and then. But I am a big hockey fan. I love the game. I still watch it all the time." Don Cherry has spoken out for a long time about the NHL not having no-touch icing, and it happened again in late January in a game between the Toronto Maple Leafs and Washington Capitals. You don't need to watch the whole thing, but it is entertaining. He was also on The Fan 590, a sports-talk radio station out of Toronto, talking about the Kurtis Foster incident and the need for the NHL to adopt no-touch icings. You can hear it here. There have been lots of players injured while trying to get to an iced puck: Foster, Ponikarovsky, Peake, Marty Reasoner, Marco Sturm, Mark Tinordi, and Brad Bombardir, for example. And for what reason? So their teammates can go back down the ice 180 feet away from where someone had his leg broken, his heel shattered, or his head concussed? I've written about making visors mandatory, and about how neck guards would help. Players, however, just don't seem to get it. "Personally, I like the race for the puck, but obviously people are getting hurt," Maple Leafs' forward Matt Stajan told the Canadian Press. "Sometimes hits are being thrown and you wonder about the respect factor. Every time there's an injury it makes everyone aware of it again. Eventually there will probably be something done." "There probably would be a few less injuries every year if it was no-touch," Leafs' defenceman Staffan Kronwall said to the CP. "But it's a tough call." Tough call? How is it a "tough call" when linesmen are already judging whether or not icing should be called when a player has an opportunity to play the puck? If it is icing, they no longer have to race down the ice to see who touches the puck first. If a linesman has his arm up, he simply waits until the puck crosses the goalline extensions. How is it a "tough call" when there are less players getting hurt? Would it be such a "tough call" if Kronwall was the guy having a stabilizing rod put in his leg? Racing for the puck can still be done as well. How much skill does it take to send a puck down the ice as hard as you can versus feathering a puck down the ice so it never crosses the line? The faster players can still give chase. I see no logic in the Leafs players' arguments. Look, the players will argue that it's a freak accident. So was Richard Zednik's accident. So was Clint Malarchuk's accident. So was Bryan Berard's accident. Yet all of these can be prevented in the future: Zednik and Malarchuk's injuries with neck guards; Berard's injury with mandatory visors; and Foster's injury with no-touch icing. Common sense just doesn't seem as common today. The "old boy's club" is over. Yesterday's NHL is exactly that: the past. It's time for the NHL and NHLPA to wise up. The death of a player shouldn't be a motivating factor. 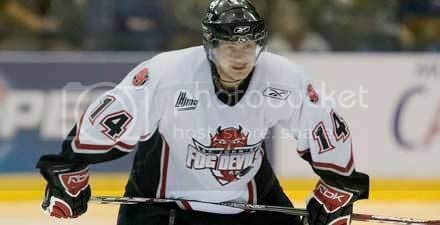 With the announcement that the St. John's Fog Devils will be moving to Montreal next season, the QMJHL will look considerably different in the 2008-09 season. Not only will there be a newly-relocated team, but the "Q" has decided to revamp its divisional groupings and the playoffs as well. Gone are the two divisions, replaced by four divisions that will categorize the teams more geographically. Of course, this is good for the game and the fans as it will mean better rivalries due to teams being located closer to one another when the playoffs roll around. The first bit of news comes as more of a shock, considering that owners rarely vote to take money out of their pockets. The QMJHL's Board of Governors voted to reduce the season from 70 games to 68 games. Personally, I like this idea as it makes every count for a little more in the scope of the season. TELUS West: Gatineau Olympiques, Montreal Junior (currently the St. John's Fog Devils), Rouyn-Noranda Huskies, and Val-d'Or Foreurs. TELUS Centre: Drummondville Voltigeurs, Lewiston MAINEiacs, Shawinigan Cataractes, and Victoriaville Tigres. TELUS East: Baie-Comeau Drakkar, Chicoutimi Saguenéens, Québec Remparts, and Rimouski Océanic. TELUS Atlantic: Acadie-Bathurst Titan, Cape Breton Screaming Eagles, Halifax Mooseheads, Moncton Wildcats, P.E.I. Rocket, and Saint John Sea Dogs. Does anyone want to guess who the major sponsor of the QMJHL is? In terms of the playoffs changing, this is a direct result of the new divisions. 16 teams will be participating for the President's Cup as always. The top four teams in each division will make the playoffs. Here's where it gets tricky. The #4 seeds in the divisions will stack up against the two remaining teams from the Atlantic division in a cross-over situation. The two teams with the least amount of points will not make the playoffs. Again, every point counts with only 68 games now, and this is magnified by the playoff situation. Speaking of the "Q" looking different, the St. John's Fog Devils will be moving to Montreal, as stated earlier in this article. It marks a triumphant return to Quebec's largest city. Fog Devils' owner Derm Dobbin butted heads with the management of the Mile One Stadium concerning rental costs, and team president Brad Dobbin said that poor attendance was making operating the team difficult. "In my opinion, St. John's has probably had its hockey. It's going to be a long time before another team comes along," Matthew Ryder, Fog Devils' media relations officer, said to the CBC. The QMJHL came to St. John's one year after the Toronto Maple Leafs moved their AHL franchise from St. John's to Toronto. While the Montreal club has yet to select a team name, they will be playing out of the Verdun Auditorium. They have, however, selected a colour scheme: home uniforms and road uniforms. They also have a bit of information on their website, which you can find here. There's your QMJHL update for today. Playoffs will be starting soon with a berth to the Memorial Cup on the line. It should be another fun-filled playoff season in the "Q"! 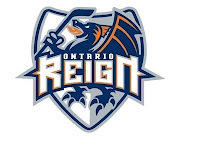 The ECHL has expanded to Ontario, and the Ontario-based team has decided on a name: the Ontario Reign! Ok, let me clarify this. The ECHL awarded a franchise via relocation to the city of Ontario, California for play in the 2008-09 ECHL season. The Reign, who are the Kings' ECHL affiliate, held a Name-The-Team Contest to determine the new team's identity. In keeping with the royalty theme throughout the Kings organization, the Ontario-based team was officially named as "Reign" on December 12, 2007. The Reign are set to become the 26th ECHL team. The city of Ontario, California is located 35 miles east of Los Angeles, and is located within the hub of Los Angeles, Orange, San Bernardino and Riverside Counties. Ontario is California's 23rd largest city, has a population of approximately 200,000 people withn the metro Ontario area, and is United Parcel Service's Western Regional Hub. It also is home to the Ontario Mills shopping mall, the largest mall in Southern California. The city was named by Canadian engineers George Chaffey and William Chaffey, who named the settlement after their home province of Ontario, Canada. The economy of Ontario is largely based on the service industries and warehousing. The Maglite corporation, who manufacture high-powered flashlights, is based there, remnants of a declining manufacturing industry. The Anschutz Entertainment Group will manage the operations of the newly-built Citizens Business Bank Arena, an 11,000-seat facility that will house the Reign. Of course, AEG also runs the Kings, and they operate and manage a number of arenas across the globe. Ok, enough with the history. Let's get to the future. The Reign logo was designed by Keith Flynn of Flynnagain Productions in Mississauga, Ontario, Canada. The Name-The-Team Contest's winning entry was submitted by Mike Brewster of Fontana, California. "This logo represents everything the Ontario Reign stands for," said Justin Kemp, Executive Vice-President of Business Development for the Ontario Reign. "The fierce image signifies strength, intimidation and power carrying on the Los Angeles Kings’ royal tradition." Personally, I think the logo is pretty good. I'm not completely sold on the colours of navy, orange and silver, but there have been no mentions made of the jersey design yet. I'll reserve the right to criticize the team's look until that time... if it is warranted. Congratulations to the people of Ontario, hockey fans in Southern California, and Los Angeles Kings' fans! You have another team to cheer for in the Los Angeles area, and you might get to see some of the future Kings before they don the purple and silver! Occasionally, I am quite disgusted with the NHL. It seems that Colin Campbell, head disciplinarian for the NHL, subscribes to the adage of "different strokes for different folks". He claims to uphold the NHL rulebook to its highest level, but he has a hard time doing it when he has no backbone. If he did have one, he would have punished Chris Pronger for more than an eight-game suspension after reviewing, for the second time, his blatent and obvious stomp on Vancouver Canucks forward Ryan Kesler. Instead, Pronger takes a couple of weeks off to rest up for the playoffs where he can deliver additional elbows to the heads of skilled forwards. After all, that's what all-star NHL defencemen do in the playoffs - they become Neanderthals. Yes, you may have guessed that I don't like Chris Pronger. At one time, he appeared to be one of the great young stars this league had to offer. He had a booming shot, and he played defence as well as anyone in the league. However, he also began developing a penchant for headshots, and started tarnishing his play with cheap shots to anyone who skated within six feet of him in an opposing team's jersey. - Pronger was arrested for drunk driving and being involved in a barroom brawl during his first season with the Hartford Whalers (1993-94 offseason). - Suspended four games for slashing Washington's Pat Peake while with St. Louis (Oct. 29, 1995). - Suspended four games for a high-stick to Phoenix's Jeremy Roenick while with St. Louis (Dec. 17, 1998). - Suspended one game for leaving the bench to engage with Los Angeles' Kelly Buchberger during an on-ice incident while with St. Louis (Oct. 11, 2000). - Suspended two games for a crosscheck to Dallas' Brendan Morrow while with St. Louis (April 3, 2002). - Suspended one game for kicking Calgary's Ville Niemenen while with St. Louis (March 14, 2004). 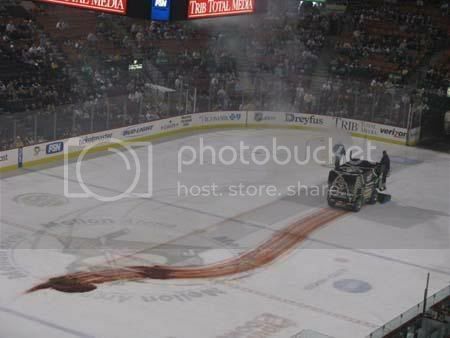 - Suspended one playoff game for a deliberate blow to the head to Detroit's Tomas Holmstrom while with Anaheim (May 15, 2007). - Suspended one playoff game for a deliberate blow to the head to Ottawa's Dean McAmmond while with Anaheim (June 3, 2007). - Suspended eight games for stomping on the leg of Vancouver's Ryan Kesler with his skate blade while with Anaheim (Mar. 15, 2008). I find it ironic that Chris Simon, currently the poster child for NHL suspensions, and Chris Pronger not only share a first name, but have served time in NHL purgatory for similar incidents. The only difference is that Simon seems to draw the harsher penalties despite his rap sheet only have eight offences on it as well. - Thirty game suspension for stomping on the leg of Jarkko Ruutu in 2007. - Twenty-five game suspension for a deliberate slash to the head of Ryan Hollweg in 2006. -Five pre-season games in 1994 for slashing Dennis Vial in the head. -Three games in 1997 after directing a racial slur toward player Mike Grier, who is black. -One game in the 2000 playoffs after cross-checking Peter Popovic across the throat. -In April 2001, Simon drew a two-game ban for elbowing Anders Eriksson. -Two games in 2004 for cross-checking Ruslan Fedotenko and then jumping on him and punching him. 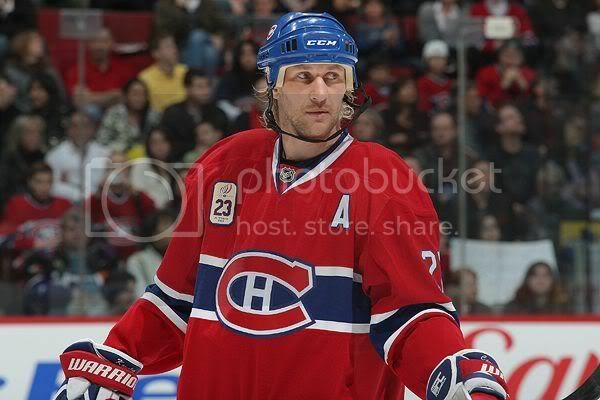 -Two games, also in 2004, for kneeing star defenceman Sergei Zubov. Total number of games missed in his career for Pronger: 22. Total number of games missed in his career for Simon: 70. Does anyone see a problem here? Isn't discipline supposed to turn a blind eye to the player, and focus on the infraction instead? Both players have used their sticks in several ugly incidents, both players have taken liberties with other players' careers by targeting their heads, and both players have attempted to injure players by stepping on them with their skates. The problem is that Chris Simon never looked at Jarkko Ruutu's leg while stomping his either. Pronger, in the video, clearly knows where Kesler's legs are. To say he didn't would be a blatent lie. While TSN's Jennifer Hedger is correct in stating that it is "almost impossible to prove Pronger's intent", it is clear to me that he is looking down before he turns and throws the stomp on Kesler. Different strokes for different folks? I'm saying yes. Sorry, Colin Campbell. If you want respect from the players, you're going to have to start doing your job. Just because he's a superstar and Brian Burke is a colleague doesn't mean you change the rules. A stomp is a stomp is a stomp. The rules state that players must remain in control of their sticks. Why is it that players don't have the same policy placed on those razor-sharp blades? It's time for the NHL Offices to start showing the players that this kind of action won't be tolerated. I don't know what it will take for the NHL to wise up, but why they are waiting until someone is seriously injured or killed is beyond me. I went into great detail why the NHL should be making visors and neck guards mandatory as soon as possible in the article entitled "Throats Are Better Than Eyes?". In that article, I gave several glaring examples about how visors should be a mandatory piece of equipment in the NHL since they are mandatory pieces of equipment everywhere else. With that, most leagues are now enforcing that neck guards be mandatory as well after watching what happened to Richard Zednik. Again, I find it absolutely insane that the NHL can promote all sorts of protective equipment but not save a player's face. However, that's just me. On the other hand, several media outlets have now joined the fight. We'll start with a highly-respected hockey media team in the panel from TSN. I'm no Pierre McGuire fan, but he is absolutely right. 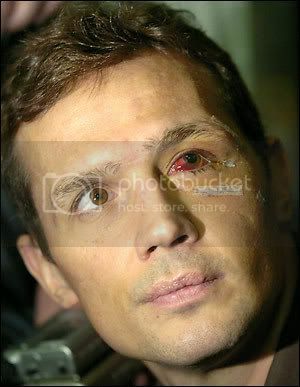 Speaking of protecting eyes, I found a picture of Steve Yzerman after he was hit in the face with the puck. I warn you now: this picture is a little disturbing. If you have any problems with seeing blood or injuries, don't click here. That alone is a very good reason to wear a visor, and it makes me a little queasy. Carrying on with media outlets who have more common sense than the NHL, the CBC is another major hockey player in the media world. Of course, they carry the NHL's flagship program in Hockey Night In Canada, and they have always had a pulse on the hockey world. In 2000, after Bryan Berard's injury, the CBC had a story on their website about making visors mandatory. The article is small, but there is one telling statistic in that story. Dr. Tom Pashby states that he has treated over 300 eye injuries from hockey, and that "of the 309 blind eyes I have seen, none occurred to a player wearing [a visor]. I'd like to see it mandatory in the NHL. We'd save eyes." In a second CBC story about the number of players wearing visors in the NHL, the CBC found that the leage average in 2005 was "8.1 visors per team". They also sought out the best and worst teams for visor-equipped players, and found that "[t]he Colorado Avalanche lead the way with 13 players, with the Ottawa Senators and Philadelphia Flyers next with 12 apiece. The Chicago Blackhawks and defending Stanley Cup-champion Tampa Bay Lightning have the least with four players each." Being that the CBC has no bearing on what happens within the NHL, the latter story makes no plea for players to use their heads. However, when eight of 22 players in an NHL team are wearing visors and with the number increasing, the decision to make them mandatory seems elementary. Ryan Dixon of The Hockey News makes a much better case in his blog, Top Shelf, entitled "Visors will never win when players have choice". In it, he speaks about how former NHLer Mike Keane, now with the AHL's Manitoba Moose, appreciates wearing the visor after being lucky for so many years: "Now in his third season with the American League’s Manitoba Moose, the 40-year-old Keane continues to wear a visor – not just because his league mandates it – but because he recognizes the painfully obvious dangers of not wearing one after eluding a lifetime’s worth of flying pucks, sticks and elbows." He speaks about Jordan Smith, the former Ducks' prospect, who lost an eye after being struck by a puck. Jordan has gone from playing in the AHL with the Portland Pirates with an NHL dream to playing Canadian university hockey for the Thunder Bay-based Lakehead Thunderwolves. On visors, Smith says, "The bottom line is it's a good idea. If it minimizes some serious injuries, who knows if it saves one guy, then it's worth it. It's definitely a good idea. It's common sense. And it's a very smart thing to do." These are three major players in the media world when it comes to the game of hockey. All three media outlets have shown that there should be something put in place to help players protect themselves. I am at a loss as to why the NHL and NHLPA cannot come to some sort of agreement in regards to making visors and neck guards mandatory. Society has changed. We used to resist the ideas of mandatory seat belts, a ban on drivers using cell phones, and smoke-free bars. Now, we embrace it. It's clear that these rules save lives. 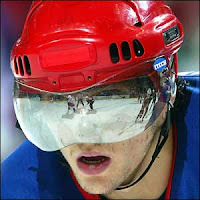 Why is it that NHL players cannot see the importance of visors when it comes to seeing? The league's owners and NHL commissioner Gary Bettman support making visors mandatory, but they can't impose it on the players without the union's blessing. And the union can't make it so without the blessing of its members. Sometimes, the right thing to do isn't always the most popular. I'm surprised that NHL players haven't figured this out yet. I always find these articles to be some of the best I've written, despite me hardly writing anything. I am actually more proud of these articles, despite them being hardly read or commented on, than I am of the work I put in on the "You're Wearing That" articles. Showing how things are made gives us a much deeper appreciation of how things work. If you've been a reader of this blog for a while now, you've seen the previous editions: Part One, Part Two, and Part Three. We've covered a lot of hockey in terms of how things are made: skates, rinks, goalie pads, composite sticks, pucks, gloves, wooden sticks, and a piece on how to relace a hockey glove. Today is no different as we look at how goalie masks are made and painted, and the ThermaBlade debate. Anytime you can get an endorsement from Wayne Gretzky, you're in good standing, I'd say. There were four NHL players that had agreed to test the the ThermaBlades this season, but the NHLPA kept their names under wraps to avoid any additional media scrutiny. However, word was leaked out that five players were testing the blades this season: Toronto's Mark Bell, Chicago's and Ottawa's Martin Lapointe, Detroit's Kris Draper, Edmonton's Marty Reasoner and Calgary's Matthew Lombardi. However, Reasoner was the only player who approved of the blades. In fact, the poor reviews from Draper and Lapointe have prompted the NHLPA to walk away from negotiations in endorsing the blades. "I wouldn't buy them," Lapointe told the Toronto Star, adding the battery-powered blades didn't always heat up. "I just didn't notice a difference," Draper told the Toronto Star after using them twice during practices. Sam McCoubrey, Therma Blade Incorporated's vice-president of sales and marketing, had this retort: "I'm not sure that wearing them twice qualifies Kris Draper to denounce the blades." McCoubrey also said the company would try to persuade other NHLers to test the blades. NHLPA boss Paul Kelly was more concerned about endorsing a product that has a high price tag while delivering little advantage to players. "Before we give our approval or endorsement to a hockey product that will increase the cost to the average family, we should take steps to ensure that this product indeed performs as advertised," Kelly said to the Toronto Star. I fully agree with Mr. Kelly on this one. More testing should be done, and good on the NHLPA for their decision on this. I know all sports fans will contend that their favorite sport has the best fans. It's just something we believe in terms of being part of that great community. Honestly, hockey fans might be the best fans in the world, though, because they are extremely close to the action. I showed off some of the stupidest things hockey fans have done in a February article entitled Instant Karma, but when hockey fans do fun stuff, they really show how creative and interactive the game of hockey is. This article is a salute to the some of the funniest and most creative things I have seen hockey fans do at hockey games. 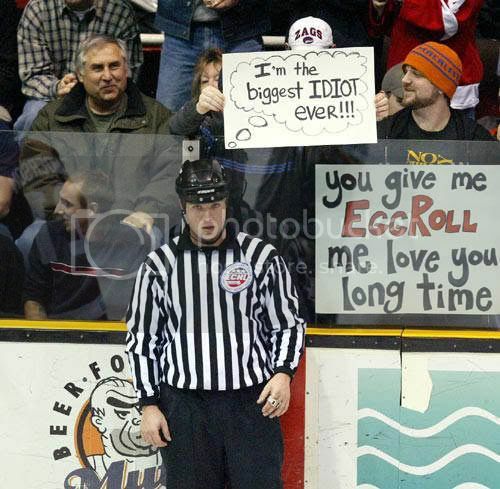 Example A: Fans bring signs to games in hockey cities across the land. Some praise the best players, and others mock the opposing teams. However, some signs simply capture the imagination and make people smile. 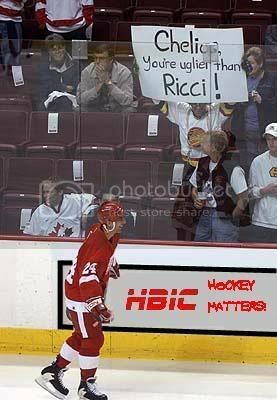 Chris Chelios has been hated in rinks throughout his career, and has developed a bit of a following around the league. Vancouver seems to have some hatred for the NHL's resident graybeard, specifically this guy and his message. Even Chelios was chuckling at that sign. Again, that's what makes the game fun - interaction. On the other side of the coin, there's the creative and fun side. The fans in the ECHL know how to be creative. This fan is an absolute genius. And the linesman is none-the-wiser despite this guy's clear creativity. This might go down as one of the best signs in history. 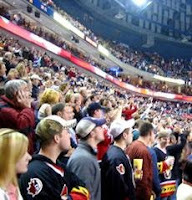 Example B: It's rare in hockey rinks that you can find 20,000 people operating as one, except when they do the wave. However, the wave seems a little played out in terms of the longevity it has been around. Hockey fans have now been bringing other facets of life into the game. The Montreal Canadiens have, for the better part of 100 years, been the backbone of the NHL. They've had amazing teams, and have churned out Hall-of-Fame players like no other team has. Montreal's fans, however, have been second-to-none as well. They are as passionate as any other team's fans in the league, and they've started a new singing trend in the Bell Centre that can only be described as "Euro-wow". Creativity and interaction at its finest. Of course, it also happens in other cities as well. Singing the anthem is a point of pride, and listening to this gave me goosebumps. That's patriotism and pride. Nothing better! Example C: Sometimes, stupid and crude funny wins out over creative funny. Although, I suppose this next video could fall under the "creative" option. However, it is interactive. Front-row tickets were never used so well. Basically, this article is a big "thank you" to all the good fans out there who like to have fun. Whether you're a casual fan or a die-hard from Section 303, hockey fans are some of the best fans in any sport played on the planet. Keep up the good work, and keep making the game enjoyable! There have been documented cases of employee versus employer throughout history that have made headlines. Heck, Sally Field won an Academy Award for her portrayal of Norma Rae in 1979. This isn't something new in terms of labour wars between the two sides. However, the seething hatred for Dan Cloutier coming out of Los Angeles today may have set a new mark. Cloutier is no stranger to controversy in his career, but this war may spell the end of his hockey career in the NHL. And it all comes thanks to a Vancouver Sun interview done by Iain MacIntyre on Monday. Iain MacIntyre is a reporter for the Vancouver Sun who, apparently, knows Dan Cloutier from his days with the Vancouver Canucks. In his article entitled Cloutier Caught In A Hard Reign, published yesterday in the Vancouver Sun, Cloutier basically spills the beans about all he's had to deal with since signing a contract extension with the Kings. In airing his grievances about the Kings, he has essentially made himself Public Enemy #1 in La-La Land. I can understand this sentiment towards the Kings' goaltender when Cloutier hasn't endeared himself to fans whatsoever with his below-average play and seemingly poor attitude. 1) The team insisted he shed his birdcage wire mask and helmet, citing insurance issues. Cloutier was never comfortable in a traditional mask, and a few games into last season he was feeling physical discomfort. Insurance issues? Are you kidding me? Why is it that Chris Osgood hasn't had to shed his traditional mask? Do different teams have different insurance policies on their goaltenders? The team cannot tell him what to wear, so this complaint is weak. Complaint rating: ♠♠ out of 5. 2) "He was having hip pain. He volunteered to keep playing because the Kings' other goalie, Mathieu Garon, had a broken finger. Cloutier's pain got worse, but the team insisted initially there was little wrong with him. Knowing his body, Cloutier pushed the issue. Only after a specialist said his career could be in jeopardy, the Kings sent him to Vail for season-ending surgery. In pain, Cloutier flew to Colorado in a middle economy-class seat and was lodged by the Kings at a Super-8 Motel about 50 kilometres from the clinic where he was treated daily." This is more MacIntyre than Cloutier, in my opinion. Yes, we know his hip was sore. It was a problem in Vancouver, and it kept being a problem in Los Angeles. However, to add "in pain" before the flight description, MacIntyre is simply trying to draw sympathy towards Cloutier. I don't buy it. He volunteered to stay when he could have shut down his season. Yes, he was a good teammate in volunteering to play while Garon was hurt, but you're not a good teammate if the losses keep piling up. Complaint rating: ♠ out of 5. 3) "They said: 'You're going to go down there and play every game, good or bad, get your game back and see what happens,' " Cloutier said of the demotion. "I actually thought it was going to be a good thing. But I got down there and all of a sudden I'm not playing. "So I said: 'All right, what are your plans for me?' They give me the old: 'We still believe in you' and all that. I played 14 games and I was down there for four or five months; you're not going to get your game back that way, especially after being out almost three years." This one seems believable. The team has to show faith in their $3 million per season goalie, but if he's losing games in Manchester, Manchester has every right to keep their fans happy. The Kings may dictate to the AHL Monarchs as to who should play, but the Monarchs want to make the playoffs just as much as anyone else. Playing Cloutier was not helping them, and changes had to be made. However, the Kings do call the shots, and they clearly were not completely honest with Cloutier. Complaint rating: ♠♠♠♠ out of 5. 4) "Cloutier's wife, Nikki, accompanied her husband to the American League, where they lived in a hotel. They were expecting their first baby in December. As the due date neared, Cloutier asked the Kings to move them into an apartment. The team balked and said the Cloutiers should stay in their hotel. "I said: 'I can't, we're expecting a baby here. I don't know if it's a big thing to you guys, but to me it's the most important thing,'" Cloutier said. "Finally, I called the [Players' Association] and they said after 28 days you're entitled to get a place." Simply brutal. Why would the player raise a grievance with the NHLPA when he's being paid $3.1 million per season to play in the AHL? Just go out and rent your own apartment. Granted, it is part of the CBA and he therefore had every right to push the issue, but sometimes common sense should win out over dollars and cents. Especially when it comes to your wife and family. Why fight your employer when you don't have to? Choose your battles wisely. Complaint rating: ♠ out of 5, only because it's part of the CBA. 5) In January, Cloutier reported to the rink in Manchester for a 12-day road trip and was told to go home, he wouldn't be playing. The Monarchs hadn't used him in eight weeks after Cloutier complained of hip pain. But the goalie said he figured he could have played after a week. He wanted to play while he was hurt? Didn't we go through this already with the Kings? The Monarchs have an obligation to their fans and their organization. 'Nuff said. Basically, as I see it, the only real complaint that Cloutier could take to the NHLPA is the fact that he wasn't being played. However, the NHLPA has no jurisdiction over these matters, despite the legitimacy of the complaint. If I were Cloutier, I'd be angry over being sent to the AHL with the promise of playing only to sit and watch from the bench. You expect people to stand by their word, yet it seems that a guarantee is only as good as the person making it. Back to the point: this is not an examination of whether or not Dan Cloutier is correct. It's not a sounding board for Kings' fans to rip Cloutier for his view of the situation either. As they say, every story has three sides. Cloutier's complaints is one side. Another side is that of Kings' fans. There have been a number of people who have defended the Kings in this situation on a number of blogs and message boards. They have every right to express their anger and frustration about a Kings player taking this dispute public in a rival city's newspaper. However, I would like to focus on one person's thoughts on the matter. Carla Muller writes for HockeyBuzz.com. You may have heard of that site due to the anonymous blogger known as Eklund (that's an E3 rumour, by the way). Carla is the resident Kings blogger on that site, and she has taken issue with Cloutier like no one else. Her article entitled Cloutier: Sour Grapes or Hip Gate is filled with venom towards the ten-year NHL veteran. More specifically, it appears that her pure hatred of Dan Cloutier has resulted in most of the Kings misfortune in recent years. Based on this hatred, she goes on a diatribe about how Cloutier "needs to man up, take responsibility or frankly get out of the way". However, she clearly must enjoy hating Cloutier or she wouldn't have started the paragraph with "I have no knowledge what teams do or do not provide for players". Contradictory? Perhaps. She goes on to write: "Even if I take Cloutier at his word, and even if the Kings owed him full rent and welched, how much should anyone feel sorry for a guy who has to pay his own rent when making $3.1 million dollars a year and rarely earning it? Does any team owe their players a free pass to finding their game? Or, more appropriately, why does Cloutier take no ownership in this?" Excuse me, Carla, but he's not asking for your pity. He didn't write the story. He simply answered questions asked by a reporter. The reporter can spin those answers anyway he likes by simply filling in the blanks. Dan Cloutier did exactly what he was supposed to do according to the contract negotiated and signed by both the NHL and NHLPA. If you had ever been part of a union, you would understand this. Granted, it is expected by the team that a player fulfill the expectations of that contract to the best of his ability. The Kings, on the other hand, want Cloutier to succeed so that the franchise succeeds. By providing some luxuries to him, they are hoping that Cloutier will win them 25-30 games, and allow the Kings a shot at winning the Stanley Cup. Of course, as documented, Cloutier was riddled with injuries during his time with the Kings. Injuries are a part of the game of hockey, and you can't blame Cloutier for being hurt. It's not like he fractured his wrist driving his motorcycle like some baseball guy named Jeff Kent. I'm sure, Carla, that you've heard of him, being that you have some affinity towards the Los Angeles area. However, is Carla angry because he's earning $3.1 million a year, or because the amount of money the Kings gave him doesn't equate to the results he has delivered? If he was earning $500,000, would she be as angry? Logic says no mainly because he doesn't tie up as much of the Kings' financial resources and salary cap room. Signing players to inflated contracts based upon past seasons of success comes at a gamble. I don't know how long Carla has followed hockey for, but she should know this. It happens in every sport on the planet. Yet Carla continues to rag on him for being left unprotected in the expansion draft, and then for his poor playoff record. If his playoff record is any showing of how poor a goalie he is, he's gone 10-13 over 25 NHL playoff games for a winning percentage of 43.5% in games where he was the goalie of record. Not great, but certainly not worse than Rick Dipietro (1-4 in 6 games), Kari Lehtonen (0-2 in 2 games), Marc-Andre Fleury (1-4 in 5 games) or Henrik Lundqvist (0-3 in 3 NHL games). The funny thing is that all of those goalies earn more than what Cloutier makes, and all of them have been out with significant injuries in their short careers thus far. Carla also throws Cloutier under the bus when she completely misquotes Kings' head coach Marc Crawford in which he compared the leadership qualities of Dan Cloutier to those of Patrick Roy. This has absolutely nothing to do with on-ice skill as much as it does with his presence in the locker room. Do you think the Ottawa Senators acquired Martin Lapointe at the trade deadline this season because they wanted his scoring touch? He's a career third-line forward at best. It's the intangible known as leadership he brings to the locker room that Ottawa wanted so badly. It's also the intangible that the Kings lacked so dearly when Crawford took over the coaching duties with the Kings. Crawford made that comment in 2006, not today. That kind of misrepresentation is why you should learn to read before speaking, Carla. And finally, as we come to the end of Carla's hate-blog, we find her not only throwing Cloutier under the bus, but the entire Manchester Monarchs team as well. She writes, "Earlier this year, I looked at Monarchs’ statistics when Ersberg and Cloutier shared the net there. They both had similar GAA and save percentages, but vastly different wins and losses. I always wondered why players found W’s for Ersberg and losses for Cloutier… until now." With the way that paragraph is presented, Carla is saying that Cloutier played as well as Ersberg did in Manchester, but the team tanked the games that Cloutier was in. I'm fairly certain that any player caught by Kings' management purposely tanking games would be in serious trouble. And any player, coach, or member of the organization that purposely loses games or instructs players to lose games due to a goaltender being unhappy with the NHL club needs to be fired immediately. And then run out of town. Carla, what you've suggested is the lowest thing anyone can do to a team, let alone one player. And if you think that, for one minute, that guys like Purcell, Boyle, Moulson, Harrold, and Klemm have no pride or no aspiration to be an NHL player, you keep on believing that they tanked games. Carla, your seething hatred for Dan Cloutier turned your latest "blog" entry into nothing more than hate mongering. And the fans that read your stuff called you out on it today on the message board. Good for you, Kings fans. You deserve better than what you've gotten, but don't let frustration turn into hate. Let me be clear: I don't agree with what Dan Cloutier did in going to the Vancouver media to voice his opinions. However, I find it extremely disturbing that he gets a public execution for his honest thoughts in the Vancouver Sun, yet no one noticed him when he alluded to his unhappiness in a Los Angeles Times story on February 15, 2008 by Lisa Dallman. "I went down to the minors at the start of the year expecting to play a lot of games and that didn't happen for whatever reason and then I was very frustrated," he said to Dallman. "It was very tough mentally when you are told you're going to play every game. Whether it's good or bad, we'll give you the chance to get your game back. I think I played a total of 12 games down there, so I wasn't very happy with that. Doesn't that sound a lot like Complaint #3 from Iain MacIntyre's story? It sure sounds like the same complaint. In fact, it's almost verbatim. He outlines the same complaints he made to Mr. MacIntyre in Miss Dallman's article nearly word-for-word. How is it that no one noticed that? How is it that no one in Los Angeles noticed that? How is it that Miss Muller missed that? Here's the deal for everyone involved in this long-winded blog entry. The next time you get a great idea about throwing a player, a team, a blogger, or anyone under the wheels of the bus, think twice. Think long and hard about what you're doing. Everyone involved has feelings, and sometimes their emotions get the better of them. Passion is good, but hurtful comments never help. All I'm asking for is for common sense to prevail. We all have the ability to think. Some just choose to speak before doing it. And that's where feelings get hurt. Throats Are Better Than Eyes?